I think we have all become used to headlines like this – Earth Just Had Its Hottest September On Record. It’s all ho-hum to us. We just don’t notice any more – we don’t bother reading the articles. This is the point made by Chris Mooney in his Washington Post article Climate records are breaking so often now, we’ve stopped paying attention. But perhaps we should stop and notice something. How often do these headlines refer to “the coldest month on record?” Surely if this was just random variation, as the climate change deniers like to tell us, we should be seeing such headlines half the time. But we don’t. Doesn’t that tell us something? We have random variation alright – but random variation on top of an increasing temperature trend. That is what we should worry about. 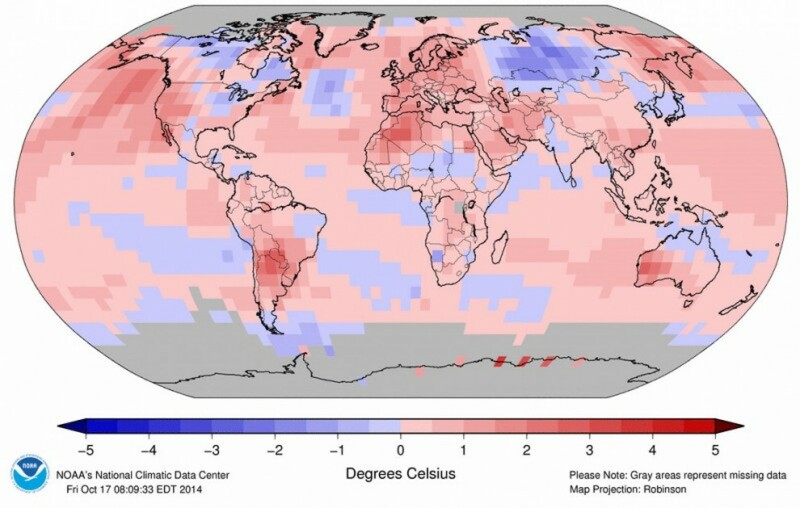 “2014 appears reasonably likely to wind up the hottest year on record, in NOAA’s accounting. In fact, to tie that record, the remainder of the year merely has to be average for the 21st century. In climate science circles, there’s already much discussion of the likelihood of 2014 setting a new record. Climate researchers are particularly struck by the fact that prior record years, like 1998 (now the 3rd warmest overall, according to NOAA) have often been El Nino years, which are hotter than average. But so far an official El Nino has not yet been proclaimed. I guess the climate change deniers will be yelling the news to the rooftops if one or more global agencies do not find 2014 to be another record year. Anything to cover up the underlying trend.